Gabriella Lopez commands respect as the battalion commander at West Broward High School in Pembroke Pines, and defines grace as a ballerina. NBC 6's Ari Odzer has more on this student working at greatness. She commands respect as the battalion commander at West Broward High School in Pembroke Pines, and defines grace as a ballerina. How's that for a 180-degree pirouette? But Gabriella Lopez says her two passions, which might seem diametrically opposed, actually complement each other. "In the dance world, whenever I'm going on stage I need to be able to focus, concentrate on my performance skills, being in front of an audience of people," Gabby says. "ROTC definitely helps me with ballet, ballet has also been able to instill qualities that I can use as the battalion commander." Gabby leads one of South Florida's best JROTC programs. She's in charge of 340 students, and she didn't even know she had leadership skills in her until she took a chance and joined the program in 9th grade. "My freshman year at West Broward, I was quite timid, I was really shy, and I didn't really know how to be involved socially with people," Gabby said. Now she's a role model for everyone, not just for young women. "Really makes no difference to us, a leader is a leader, and whether it's a young lady or a young man, we put in the best qualified, and she is certainly the best qualified," said Lt. Col. Kenneth Merkel, the JROTC teacher. "She's a leader in the classroom, she's a leader outside the classroom." Gabby is active in DECA, in National Honor Society, and other clubs which take up her time, not to mention the hours and hours of drilling with the JROTC and more hours of practice with her dance academy. None of this is lost on her admiring classmates. "Battalion commander is a huge responsibility, she's able to handle everything that life throws at her," said classmate Eva Cruz. "So, so many people look up to Gabby," added classmate Paula Colon. "Everybody's always like, I can't believe Gabby's doing this and Gabby's doing that and how does she balance it all?" As battalion commander, Gabby has to be a teacher of the younger cadets, and this senior relishes that role. "They can always come to me for help, and I really enjoy having that sort of mindset," Gabby said. For Gabby, staying in the JROTC isn't something she had to do. She could've opted out this year to take a dual enrollment class or another AP class, but she does this because she loves it, it's a way of life. "I've been able to mature and I've been able to blossom as this new person that I am today," Gabby says, giving JROTC credit for its impact on her. She says the program taught her communication and time management skills and helped her gain confidence. 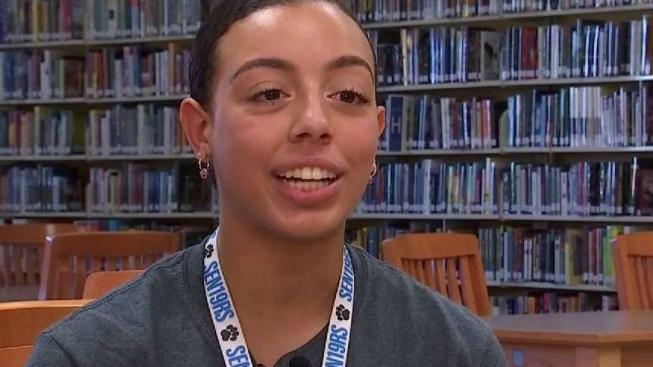 Gabby is a top student, she wants to major in fine arts in college, so it looks like ballet wins over the military, even though her foundation was built on her JROTC experiences. "You want to have grace under pressure and be able to not only stand above all of these expectations but be able to surpass them," Gabby said. She sets the bar high every day.